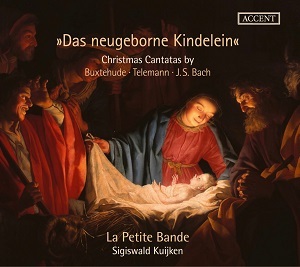 Telemann’s 1720 Missa sopra “Ein Kindelein so löbelich” uses the tune as a cantus firmus. Over this foundation Telemann weaves four-part counterpoint that pays homage to Palestrina and other late-Renaissance masters. That’s also true of Bach’s Ich freue mich in dir, which is at the center of the program. The difference is style. Telemann’s late cantata is written in more of an Italian style, and has a lightness to it.